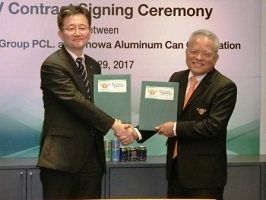 Showa Denko (SDK), Showa Aluminum Can (SAC) and Carabao Group have agreed to set up a joint venture (JV) to manufacture and sell aluminum cans in Thailand. The joint corporation is part of CBG’s plan to meet its increasing demands for Carabao energy drink in the Southeast Asian countries and the UK. The firm exports their products in aluminum cans as containers. In addition to expanding overseas business, CBG intends to ensure a stable supply of high-quality aluminum cans though the new partnership. In May 2014, SAC acquired majority stake in Vietnam-based Hanacans Joint Stock Company (Hanacans). As a result, SAC announced in February 2017 to open Hanacans’ second plant to manufacture aluminium cans in the suburbs of Da Nang city, mid Vietnam. SAC, a consolidated subsidiary of SDK, and SDK will jointly own 26% in the new joint venture while Carabao will have 74% stake. The partners will invest a total of 700m baht ($63.9m) in the JV, which will focus on manufacturing and selling aluminium cans in Chachoengsao Province, Bangkok. As part of this effort, a new can plant will be established which would help SDK’s plan to expand its operation in Asia. Scheduled to be commissioned in October 2018, the aluminium can plant will be equipped to have a production capacity of 1 billion cans annually. The new company will be responsible for the supply aluminum cans to the adjacent factory of CBG while Hanacans will have the right to supply aluminum can lids to the new company. Image: Officials from Showa Aluminum Can Corporation and Carabao Group Public Company. Photo: courtesy of SHOWA DENKO K.K.